Summer has only just begun and the Cedar Rapids, Iowa City, Des Moines, Waterloo, and Quad Cities areas are already seeing 80 and 90-degree temperatures. The question is, can your lawn handle the extreme heat? At Lawn-Tek, we suggest the following tips and tricks in order to maintain a healthy, and beautiful lawn during the extreme heat of the summer. A common mistake made by homeowners and many area lawn maintenance companies is cutting a lawn too short. 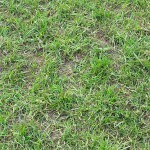 When grass is cut too short, it reduces the plants’ ability to produce energy for growth. However, when cut at the proper height, grass develops stronger roots that are more tolerant of stress. 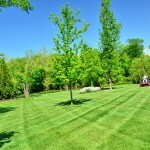 The best cutting height for Iowa lawns is 3″ to 3 1/2″ high. When setting your mower height, it is important to remember the “one-third” rule: never remove more than one-third of the grass height at one time. By doing so, the lawn is kept cooler because less plant tissue is removed. If a lawn is normally cut at 2.5 inches, for example, increasing it to 3 inches in the heat of summer will come with many benefits. One misconception about maintaining the lawn in extreme heat is that you must consistently water the grass. In fact, it’s pretty common that after rainfall, people still irrigate their lawns! A general rule to keep in mind is that turf grasses do better when they are on the dry side rather than wet. Soil that is constantly wet creates too many problems for plants and soil organisms alike. Since they are essentially being drowned in water, the grass roots will be deprived of oxygen and may become more susceptible to disease since diseases thrive in wet conditions. In general, the drier the grass and soil, the less disease there will be. Another rule-of-thumb is to water “deeply and infrequently.” Water deeply to wet the entire root zone, and then do not water again until the grass is dry. To determine next watering time, simply keep an eye on it and if it starts to look dry, then water. While it is important to be adequate on hydration, do not water the grass daily. Lawns need only one-inch of water per week, including rainfall. Avoid mowing the lawn during prolonged drought seasons. Lawns under such stress are limited in their ability to recover from mowing and can be damaged even more. Instead, mow the grass after a rainfall or after irrigation day. Just as importantly, resist mowing wet grass to avoid clumping. When grass is cut with a sharp mower blade, the plant will heal faster than when cutting with a dull blade. Dull blades actually tear the plant tissue, not cut it; this torn grass tissue will develop a brown appearance at the surface and may become more susceptible to stress and disease. Sharper blades will prevent a brown appearance and help to prevent further harm to the plant. Return clippings to the lawn by using a mulching mower. Contrary to popular belief, clippings are actually beneficial to the lawn, as they act as a slow-release fertilizer for the plant as they decompose. It is important to aim the clippings away from streets, storm drains, and bodies of water. When near bodies of water, you should bag the clippings within one or two mower widths of the water’s edge to reduce pollution of streams and lakes from the nutrients released from decomposing leaf tissue. An overall two-pronged approach will make maintaining a healthy lawn during the heat of summer an easier process. Step one: Maintain year-round health. 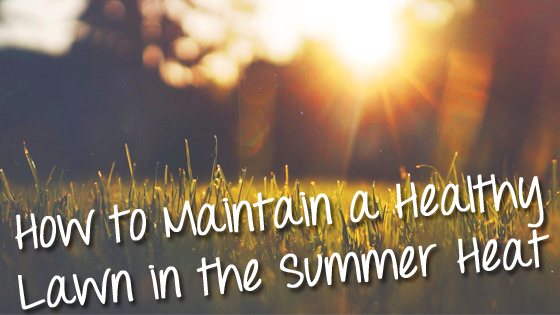 Grass will tolerate the heat better if it is in a healthy state throughout the entire year. Season-long care includes proper fertilization, weed control, watering, mowing, and pest control that all help to produce a consistently healthy lawn that is best able to tolerate stress. In terms of your own health, think of step one as eating right, regular exercise, and good sleep to ensure your best long-term health. Step two: Use best management practices during the actual summer stress period – all the things described above. 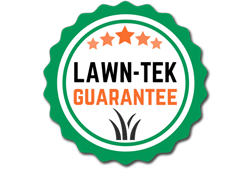 Our number one priority at Lawn-Tek is to leave each and every homeowner satisfied with a beautiful and healthy lawn that can be enjoyed all season long. 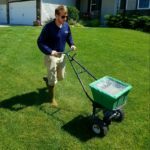 Our technicians in Cedar Rapids, Iowa City, Des Moines, Waterloo, and the Quad Cities are trained and experience in the best practices for lawn fertilization, weed control, lawn pest control and more. Contact us today for a free estimate or fill out our online free estimate request form.